Take a break from Adelaide with a short trip to The Cedars in Hahndorf, about 30 minutes away. Dedicate the 30th (Tue) to wine at some of the top wineries in the area. Next up on the itinerary: admire the natural beauty at Adelaide Botanic Garden, hunt for treasures at Adelaide Central Market, see where the action happens at Adelaide Oval, and do a tasting at National Wine Centre of Australia. To find other places to visit, traveler tips, where to stay, and more tourist information, go to the Adelaide travel planning website . The Route module shows you travel options from your home to Adelaide. April in Adelaide sees daily highs of 26°C and lows of 14°C at night. Wrap up your sightseeing on the 2nd (Thu) early enough to travel to Robe. Robe is a town and fishing port located in the Limestone Coast of South Australia. Kick off your visit on the 3rd (Fri): indulge your thirst for a good beer at Robe Town Brewery, do a tasting at Wangolina, then make a trip to Cape Dombey Obelisk, then enjoy the sand and surf at Robe Beach, and finally view the masterpieces at Wilson's at Robe. Planning Robe trip won't be overwheling when you use's Insprock itinerary maker. Drive from Adelaide to Robe in 4 hours. Finish up your sightseeing early on the 3rd (Fri) so you can travel to Warrnambool. Warrnambool is a regional centre and former port city on the south-western coast of Victoria, Australia. 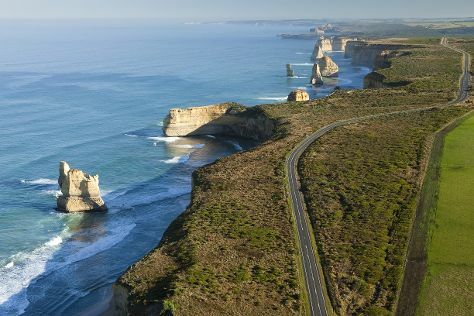 Get out of town with these interesting Warrnambool side-trips: Port Campbell (Port Campbell National Park, Loch Ard Gorge, & more). There's lots more to do: explore the activities along Bay of Islands, kick back and relax at Foreshore Promenade, get impressive views of Tower Hill Wildlife Reserve, and tour the pleasant surroundings at Lake Pertobe Adventure Playground. For traveler tips, maps, and tourist information, read Warrnambool trip itinerary planner . You can drive from Robe to Warrnambool in 3.5 hours. Cap off your sightseeing on the 6th (Mon) early enough to go by car to Apollo Bay. Apollo Bay is a coastal town in southwestern Victoria, Australia. On the 7th (Tue), get great views at Mariners Lookout, delve into the lush surroundings at Mait's Rest, then hike along Great Ocean Walk, and finally look for gifts at High on Heels. To find ratings, photos, where to stay, and more tourist information, read Apollo Bay tour itinerary planner . Traveling by car from Warrnambool to Apollo Bay takes 3 hours. Alternatively, you can take a bus; or do a combination of train and bus. Finish your sightseeing early on the 7th (Tue) to allow enough time to drive to Torquay. Start off your visit on the 8th (Wed): take a memorable drive along The Great Ocean Road and then let little ones run wild at Torquay Foreshore Play Park. To see maps, more things to do, and other tourist information, read Torquay visit planner. Traveling by car from Apollo Bay to Torquay takes 1.5 hours. Alternatively, you can take a bus. In May, plan for daily highs up to 20°C, and evening lows to 8°C. Finish up your sightseeing early on the 8th (Wed) so you can travel back home.